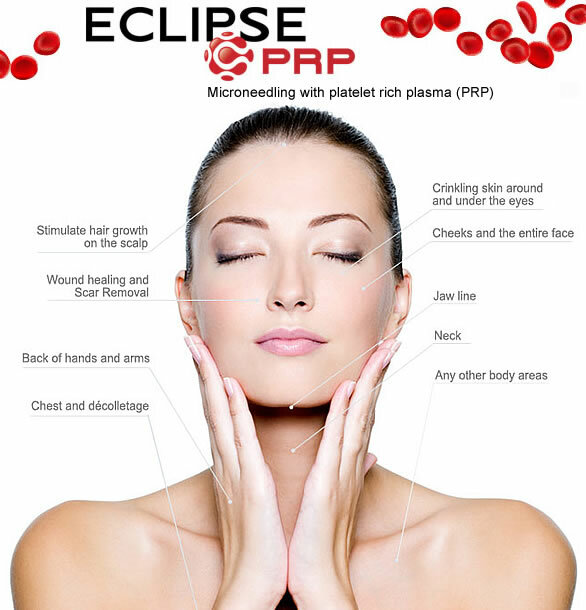 Platelet rich plasma or PRP is a natural product and treatment created from your own body. It involves obtaining a sample of your own blood for concentration and then separation of the red and white cells from the platelets and the plasma. Rich platelets containing growth factors are in this concentrated plasma. This is then re-administered into your skin at your appointment. Platelets are the cells in the blood that help tissue to heal and stimulate new cell growth. When the PRP is injected into specific areas of the skin, it acts as a matrix that promotes your own collagen to grow and regenerate tissue as well as speeds up the skin’s repair process. This repair process results in smoother, tighter skin, less scarring, and improved skin tone. WHAT DOES THE PRP TREATMENT CONSIST OF? After separating the highly concentrated platelet rich plasma from your own blood sample, it will be prepared into a series of injections. These take a few minutes to administer and are mildly uncomfortable due to topical numbing. After the injections are complete, the less concentrated plasma is applied to the surface of your skin. A microneedling pen that is comprised of sterile needle tips needle is used to create controlled micro channels in your skin. This creates tissue injury which gives an added jump start to the PRP to stimulate tissue repair and growth. The microneedling procedure is relatively painless and take about 15 minutes to complete. When the injections are paired with micro needling you get even greater results than microneedling alone. WHAT TO EXPECT BEFORE AND AFTER THE PROCEDURE? While the PRP is being prepared your skin will be cleaned and numbed for the treatment. The injections and microneedling is done using your body’s natural product. Mild swelling and moderate redness will occur and will fade within 1-3 days. Occasionally, there may be some bruising which should resolve within 5 days. Typically, the downtime with this procedure is very minimal and the results are well worth it. The goal of PRP skin rejuvenation therapy is to improve skin tone and texture, tighten skin, decrease scarring, and soften lines and pores. Result begin to show 3 to 4 weeks after the treatment session and continue to improve with time. Three treatment sessions are generally recommended spaced 1 to 2 months apart with the best outcomes after 3-4 treatments within a 3-6 month timespan. We also recommend maintenance treatments 2-3 times a year (every 4-6 months) going forward to keep your great results. WHAT DOES PRP DO FOR THE SCALP? Hair loss is one of the most disappointing cosmetic issues that can affect men and women and can lead to drastic deterioration in confidence. 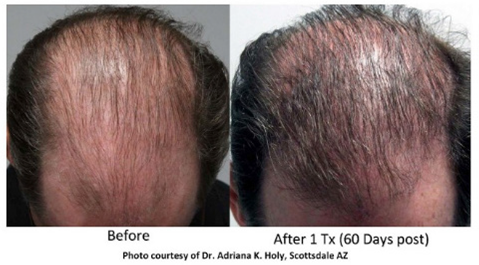 For those looking to reverse the effects of hair loss, PRP is a useful and all natural option. It is a technique that is all natural and non-invasive that has numerous studies and patient outcomes demonstrating its effectiveness of PRP hair restoration. HOW DOES PRP WORK ON THE SCALP? PRP is rich with essential nutrients and growth factors that are believed to help decrease inflammation and stimulate new follicular hair regrowth. PRP is most effective when used in conjunction with other treatment options and prescription home care which our providers can discuss with you at your initial appointment. Men and women experiencing symptoms of hair loss will likely benefit from this procedure in conjunction with other treatment options. If you are experiencing these symptoms, an initial consultation with one of our providers is important to discuss your needs and goals. Unfortunately, PRP does not work for all types of hair loss so it is important to discuss this with a provider prior to treatments.